2-Place 2 of Dr. Miller’s Ultimate Tea bags in the heated water, cover and steep at least 2 hours. 3-Pour into pitcher (half-gallon) and fill with water (use your favorite sweetener) *leaving Dr. Millers Ultimate Tea bags in the pitcher till all the tea is gone. 4-Refrigerate and it’s ready to drink. *You may drink it Hot or Cold. 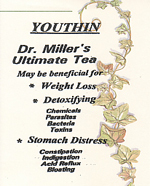 Dr. Miller’s Ultimate Tea may be mixed with any of your favorite teas or beverages. WARNING: This product contains cathartic herbs. Pregnant and nursing women, the elderly, children, and individuals suffering from any illness or health condition should consult with a physician prior to using this or any herbal supplement. Doctor Miller’s Ultimate Tea is not a drug, nor intended to diagnose, treat or cure any disease or illness. You should consult with your physician before starting this or any other cleansing exercise or weight management program.